SoftPlanet makes it possible for everyone to get free Sony PC Companion download directly from our servers. There is no registration needed for downloading. In the past decade, mobile devices began to take over the entire world. Thus developers started developing software applications, which would help you manage your handheld devices through your computer. The solution from Sony is called Sony PC Companion. It is a software application, which has some handy tools for managing your smartphone/tablet content. Sony PC Companion comes with the most needed tool for your Sony handheld device. 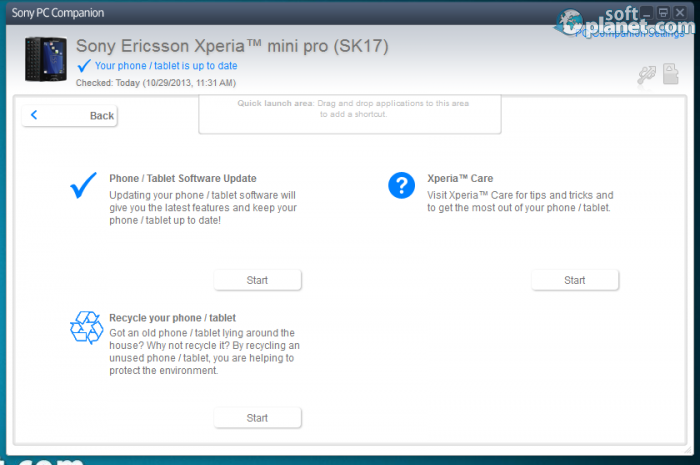 You are able to manage firmware versions, thanks to the Support Zone feature. 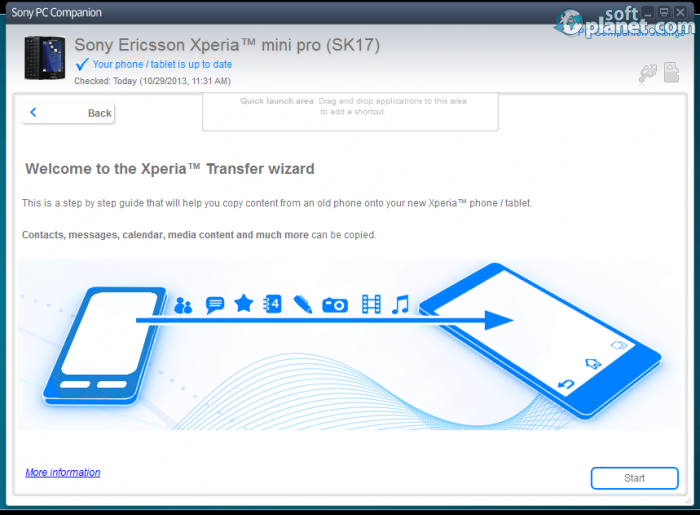 One of the toughest jobs is to transfer your content from your old smartphone to your new one. 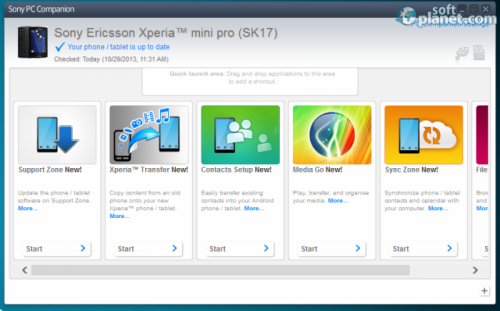 Sony PC Companion provides you with a solution to this problem as well, called XperiaTM Transfer. You will probably ask “What about my contacts?”. Don't worry, the developers have implemented a tool, which is perfect for handling your contact information. If you need to browse and organize your memory card content, you are really capable of doing so through the Sony PC Companion 2 interface. This program has a really well-organized interface. There are no unnecessary menus, just the most needed tools, which can be reached with a single mouse-click. 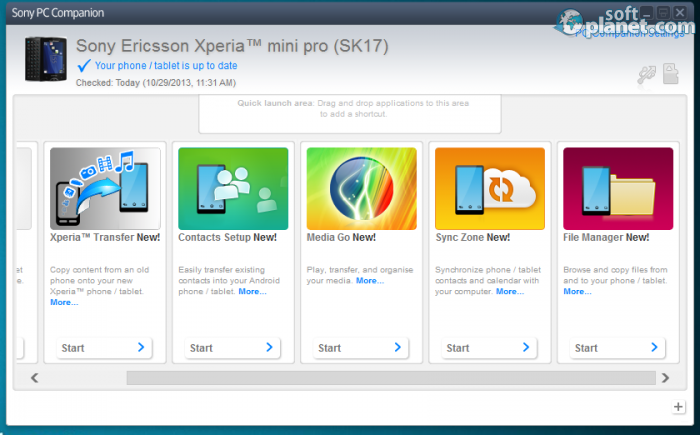 The app window includes only the available tools, which are represented by large icons. So even if you cannot read you can understand their purposes. There is some kind of a banner at the bottom side of the main window, which contains links to Sony's website. However you are able to minimize it very easily, thanks to the Minimize icon next to it. Once you have connected a handheld device, Sony PC Companion displays an image of your smartphone model. The program comes with a really classy and clean design. It really represents simplicity and beauty. 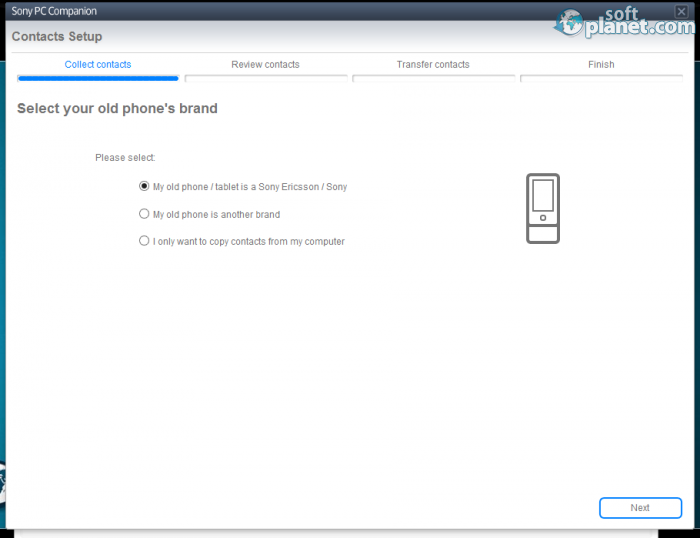 Sony PC Companion 2.10.251 is a reliable software application for your Sony mobile device. It didn't crash or lag once during the entire test. I was amazed at how quickly it detects devices. Like I said earlier, there are several available tools. However in order to launch them you need to install them first. Most of them are small-sized and it takes a few seconds to get them. However if you want to run the Media Go tool, you need to wait a little bit more, because of its size (approximately 100 MB). Sony PC Companion showed great performance and abilities to manage mobile devices content quickly and easily. Sony PC Companion 2.10.251 is the ultimate toolkit for your Sony handheld device, directly distributed by the manufacturer. It is absolutely free and comes with some great features, which can really ease the content managing process. Sony PC Companion is VIRUS-FREE! Our security scan shows that Sony PC Companion is clean from viruses. The current version of Sony PC Companion has been scanned by our system, which contains 46 different anti-virus algorithms. That ensures that Sony PC Companion 2.10.251 is 100% safe for your computer.